What do a nutrition app, sleep quality and transit systems have in common? They are all topics of graduate research at the University of Ontario Institute of Technology (UOIT). Each of these theses were placed under the microscope at an event Tuesday and Wednesday. The event, called Three Minute Thesis (3MT), is an international, university-wide competition which involves masters and graduate students presenting their research in – you guessed it – three minutes or less. “It’s really important to us they have applied skills that take them that extra step into the workplace or further into academia,” says Andrea Brown, graduate studies communications coordinator at UOIT. 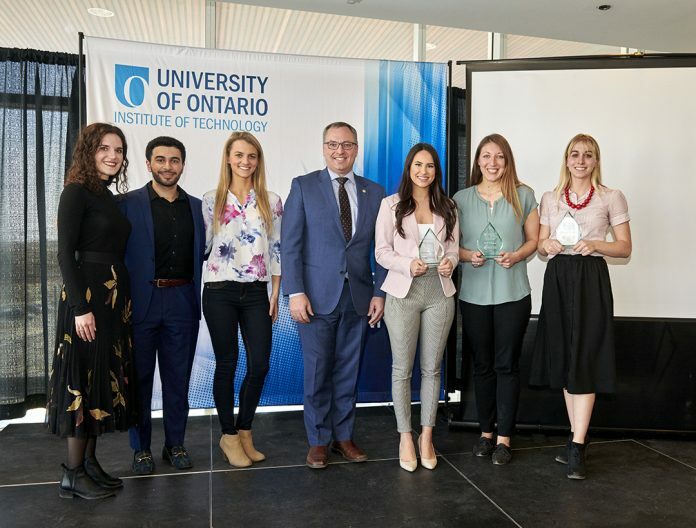 UOIT’s 3MT 2019 winner is Sarah Habibi, whose research is about parasitic worms in livestock. She will go on to the provincial competition at McMaster University on April 17. One of the key components of 3MT is the ability of students to present detailed research in a tangible fashion, says Brown. “Public speaking skills are certainly something that can be used in any avenue they go in,” she says. UOIT has been helping students with those skills since 3MT started in 2013. Each year has seen an increase in participants and audience attendance, including more undergraduates coming out to see the research, Brown says. In addition to the competition, participants also had to attend at least one of the coaching sessions, designed to build their confidence and speaking skills. Jacqueline Brown, whose research is in a nutrition-based app meant for children and teens, says the coaching sessions helped her, especially those with speaker and trainer, Karen Martin. “Karen did a wonderful job of helping us to just get out of our own heads and feel comfortable speaking in front of others,” Jacqueline Brown says in an email. It’s a sentiment echoed by Andrea Brown. “We like to say they kind of get their nerves out with us and get those out of the way to do the real thing,” she says. Jacqueline Brown made it to the finals Wednesday. She says she is happy she participated and the event pushed her out of her comfort zone. “Even though 3MT is a competition, all the participants were very supportive of each other and the event is really a celebration of all of our research,” she says. Each students thesis was marked using three criteria – communication, comprehension and engagement. The judges were comprised of people who have a vested interest in what research UOIT is doing. “The thought of having to stand in front of an audience and present your work, that you know a lot about but not a lot of other people know about, is a little daunting,” says Nancy Fynn-Sackey, whose research is in sleep quality and its links to depression in UOIT students. She says the event helped her express her research in a way people can understand, relate and see the importance. Fynn-Sackey says listening to other presentations helped open her eyes to other students’ research, adding sometimes you can be stuck in your own work. “We all do research in different areas but it’s all important,” she says. There were six students from the faculty of science, 14 from the faculty of health sciences, one from the faculty of social science and humanities and two from the faculty of engineering and applied science. One of the participants from the faculty of engineering and applied science was Taylor Egan, whose research is in connecting mass transit systems through interconnected microgrids. He says he attended all of the coaching sessions and also practised a lot in front of the mirror for his pitch. It must have helped because Egan says now he does not shy away from public speaking. He also enjoyed listening to the other participants. “It allows us to look at the bigger picture of why we are doing our research,” Egan says. While students can’t see their scores, feedback is available through the graduate studies office.